Sexton has spent the summer league as primarily a volume scorer from the lead guard spot, averaging 17.8 points on 43.3 percent from the floor through six games. However, Sexton is doing most of his damage inside the arc, as he’s shooting 46.3 percent (37-of-80) on 2-point shots but only 20 percent (2-of-10) from downtown. The lack of a consistent 3-pointer could be a problem at the next level, as he’ll need that shot to be a consistently effective scorer at his size. While these drives in Vegas generally led to either made layups or drawn fouls (Sexton has averaged 6.7 free throw attempts), it’s unclear if he’ll have the size and explosiveness to finish with as much success at the rim at the next level. But Sexton also demonstrated the ability to either pull up off the dribble or to find teammates with kick passes off the drive. Sexton took at least four jump shots off the dribble on Sunday, which resulted in three made midrange jumpers. This is a shot that should be a weapon for him in the NBA. It was heartening to see Sexton be able to set up teammates for so many shots on Sunday, because that has been a question mark during his Vegas stint. 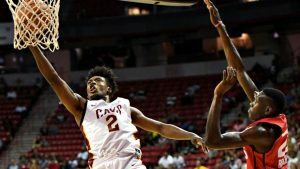 Sexton has had three summer league games with three assists or less — including a goose egg in his debut against the Washington Wizards — and it remains to be seen if he has the court vision to be a full-time floor general. However, if he can be disruptive and leverage his own scoring to create assist opportunities, Sexton can at least be effective in a combo role, perhaps splitting time with George Hill or Jordan Clarkson.